I’ve made a mermaid tail! And now I’m going to attempt to write the pattern up so I can remember how I did it! Hopefully, that gives you an idea of what you’ll be making. The Yarn: I used Hobby Lobby’s Yarn Bee Soft Secret size 4 medium weight. 6oz, 198 yards per skein. I bought 7 skeins. 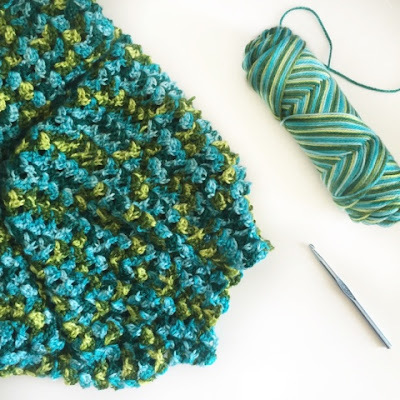 I recommend a variegated yarn for this pattern so you get lots of color without having to change colors. But, if you want to do a solid feel free! I’d love to see how that would turn out. ROW 7: CH 3, *3 DC in the next CH 3 space, CH 3, 3 DC in the same chain space again, repeat from * to end of row, 1 DC in the top of the turning chain, turn. ROW 61- until I thought it was gathered enough to my liking, (about 3 or 4 more rows) I decreased 3 or 4 times on one row using the same technique. Again, I’m going to encourage you to use your artistic self and decide how dramatic of a tail you’d like to make. I think the amount of chains you do depends on how long you have made your tail. We will be starting on a long end, then decreasing to the center, then adding back to make the other side of the fin. 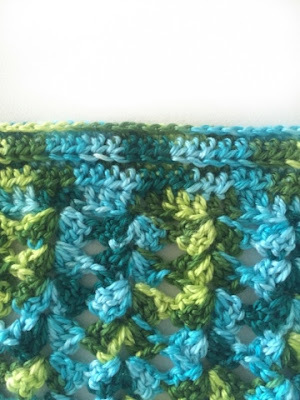 The long straight edge of the fin will simply be slip stitched to the bottom of the blanket, gathering it up as you go. ROW 3: CH 2, DC across to the last 2 stitches and DC2TOG those two stitches. turn. I wish you good luck understanding my instructions, but please let me know if you find a mistake, or if something doesn’t make sense. Also feel free to modify and use your own ideas! 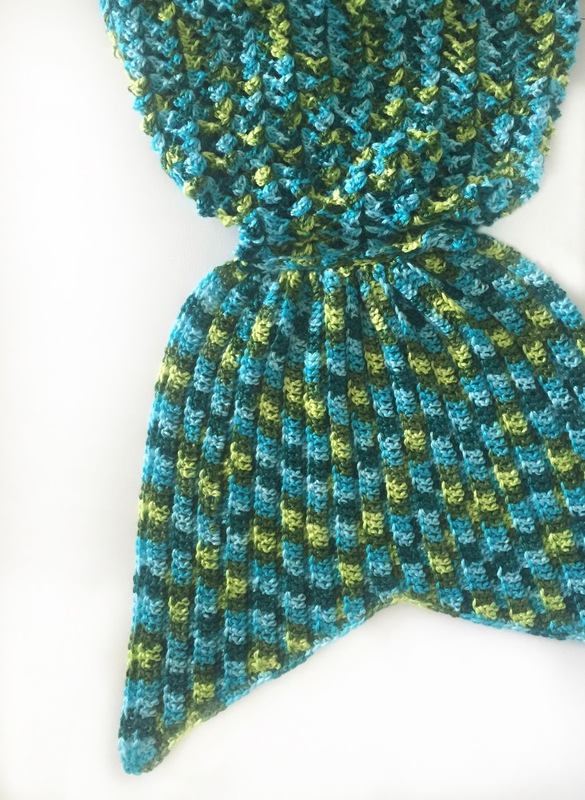 Here’s a tip about using the variegated yarn, there are very few ends to sew in, and it makes the tail look so mermaid-ish! I do like this yarn bee brand, but I bet Caron Simply Soft would do a good job and is comparable to the yarn bee. In Red Heart, maybe try the “with love” line, but stay away from super saver, I just don’t think you’ll like the results. It tends to be stiff and scratchy. If you find something that works, I’d love to know too! The easiest and fastest way is to find me on [email protected]. Or shoot me an email at [email protected] or feel free to leave a comment. I also have a Facebook page, a Pinterest page, a Twitter account, a YouTube channel all named Daisy Farm Crafts. So come and find me! I do love Instagram the best and I’d love if you’d tag me and share a picture of your mermaid tail!